The manager of Kent’s Haymaker Farmers’ Market initially decided to join the Kent Community Timebank to meet her neighbors and to support the director of the program, her good friend, Abby Greer. 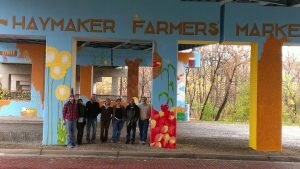 But it didn’t take much for this business-minded communitarian to see the possibilities between the community-minded Timebank and the community-minded Farmers’ Market. “I saw a lot of potential right away, how the market could be involved with the Timebank,” Kelly said. Indeed, soon after Kelly and the market joined, Timebankers were offering to sell T shirts, pass out market surveys and swipe cash cards at the market each Saturday, freeing Kelly to do the work of managing dozens of vendors and hundreds of customers. 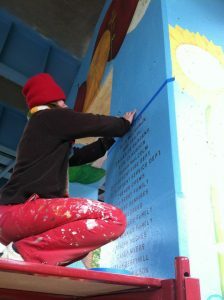 But it was when a bank of Timebankers came together to help create the mammoth, 3,000-square-foot mural on the bridge surrounding the market that Kelly began to experience the full-blown effects of community partnership. 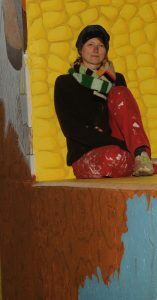 Kelly had been able to raise enough donations to buy supplies and to pay area artist Elaine Hula Hand to create the vision and paint the mural. But the gritty work of prepping and priming the bridge and helping with some of the painting details was going to require more woman and manpower than the market could afford. There was also a time constraint: The six-month project, begun in May 2012, needed completion in October, before cold weather set in. Kelly remembers a particular moment when Timebankers came to the rescue. Word went out within the Timebank network. And soon, hands, using scrapers and grinders, were taking the place of the power washer. Kelly says she has lots of ideas for future Farmers’ Market-Timebank collaborations, one of them a local foods dinner under the bridge. Timebank and the Farmer’s Market together is win-win, Kelly says. “The Farmers’ Market is huge for the social networking opportunity,” Kelly says.